Find out who will win? In Today’s Dream11 Fantasy Cricket Match Prediction of ENG vs AUS 1st ODI, we will cover pitch report of Kennington Oval, London, toss prediction and possible playing 11. We will also cover all the latest news and details of Australia Team and England Team, players recent and past performance, dream11 best teams, key players, the best choice for captain and vice-captain, weather report of London, dream 11 guru and crictom expert prediction, where to watch the live match of AUS vs ENG, 1st ODI and the details of live streaming of Australia tour of England, 2018. We have done a detailed and comprehensive analysis of the match. All the details in this post are taken from very reliable sources. Make sure to read the complete post to get 100% result. All the details in this post are absolutely free of cost and you don’t have to pay a single penny. We provide tips, tricks and suggestion on fantasy cricket in every section of the post. Make sure to read all the fantasy cricket expert suggestions. If you ever asked any dream11 experts, they must have told to that, to win in any fantasy leagues you should have the above details. Our strategy is very simple, we predict the players, the players perform and you win. Where Can You Watch the Live Streaming of ENG vs AUS or Channels to Watch? Who Will Win the 1st ODI Match, Between ENG vs AUS and Toss Prediction? What is the best combination of players for Dream11 and Fantasy Leagues for 1st ODI Match? Date: The match will be played on 13th June 2018 (Wednesday). 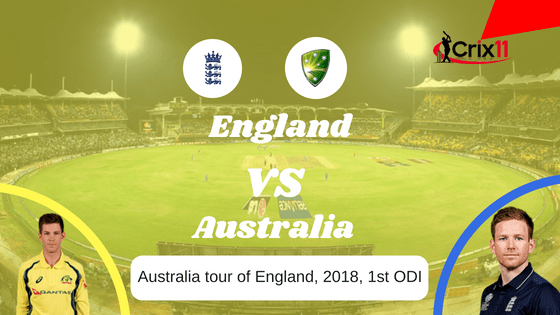 Match: Australia tour of England, 2018, Eng vs Aus, 1st ODI. The pitch of London, Kennington Oval is most likely to favour the batsmen. The wicket is a batting beauty, whatever the format is. Ten 300+ scores have been registered on this ground since 2015. There will be no swing on this ground. The spinners may get some help due to dry weather. The weather in London will be mixed. In the morning, will be sunny. Most of the time it will be partly cloudy but there is no chance of rain. The cricket fans and fantasy users can get the complete game. The temperature is expected to be 20-Degree Celsius and the humidity to be 46%, which may rise up to 77%. The average first inning score of this ground is 250. The average second inning score of this ground is 213. Highest total on this ground is 398/5 in 50 overs by NZ vs ENG. Lowest total on this ground is 103/10 in 41 overs by ENG vs SA. In the last five matches, AUS won one match out of five whereas ENG won four games out of five games. In overall encounters, Australia has won 81 matches and England has won 56 matches. ENG has won 39% of the games and AUS has won 57% of the games. Sam Billings (wk), Alex Hales, Jake Ball, Eoin Morgan (c), Jos Buttler, Jason Roy, Liam Plunkett, Jonny Bairstow, Adil Rashid, Joe Root, Mark Wood, Moeen Ali, Tom Curran, David Willey. Shaun Marsh, Tim Paine (c & wk), Billy Stanlake, Aaron Finch, Nathan Lyon, D’Arcy Short, Jhye Richardson, Travis Head, Andrew Tye, Glenn Maxwell, Alex Carey, Ashton Agar, Michael Neser, Marcus Stoinis, Kane Richardson. Australia and England are all set to play their five matches One-Day International and only T20 Match. England has been one of the consistent sides in ODI format in last one year. Their lost against Scotland will definitely hurt them. It will be interesting to how both the teams make their playing 11 combinations. We will give you the probable playing 11 in the next section. Jos Butler is back in the squad, who has been rested against Scotland. Two of the star players (Stokes and Woakes) will not play because of injury. David Willey was very expensive in the last match against Scotland, so either Jake Ball or Tom Curran will play in place of Willey. Jonny Bairstow and Jason Roy may open the innings for England. Jonny Bairstow, Alex Hales, Eoin Morgan (capt), Moeen Ali, Liam Plunkett, Mark Wood, Jason Roy, Joe Root, Jos Buttler (wk), Adil Rashid, Tom Curran/David Willey/Jake Ball. Australia Team is going through a tough time. Head Coach of Australia, Langer told that he is going through sleepless nights to make the perfect combination. Aaron Finch may take the responsibility of middle order. Langer may play with extra seamer in place of Maxwell. D’arcy Short and Michael Neser, either of the two may get a chance in 1st ODI. D’arcy Short, Marcus Stoinis, Aaron Finch, Ashton Agar, Jhye Richardson, Billy Stanlake, Travis Head, Shaun Marsh, Tim Paine (capt & wk), Michael Neser, Kane Richardson. Pro-tips: Both the players are good but you can select Jos Butler over Tim Paine. 80.17% of the fantasy users have selected Butler and 19.13% of the users have selected Paine in their dream11 teams. Make a combination of the above players for multiple teams. Pro tips: The above all-rounders are most likely to contribute today. Make a combination of the above players for multiple teams. Pro Tips: The above players are most likely to perform today. You may take them as a captain and vice-captain. You can also take captains from key players. Pro tips: The above players have performed in the previous matches. You can select them as a captain and vice-captain. Australia Team is going through a tough phase while England Team has lost their last match against Scotland. On Paper ENG is a strong team and has been consistent. According to our astrology prediction, ENG will win today. The team winning the toss should bowl first as chasing will be easy in the second half of the game. According to our astrology prediction, ENG will win the toss and they will ask AUS to Bat first. Try to pick six or seven players from the home team. It will be a wise choice to take more batsmen in your teams. If it rains, the pitch will start favouring the seamers, so try to keep seamers in your teams. Marcus Stoinis is one of the most valuable players to have on your teams. Conclusion: This is it for Today’s Dream11 Fantasy Cricket Match Prediction of ENG vs AUS, 1st ODI Match, which will be played on Wednesday 13th June. You can give your valuable feedback in the comment section. Subscribe to our notification of latest updates. GOODBYE!